On a recent trip to the Southeast for a summertime conference, Megan Edwards found herself with time on her hands and a favorite road trip calling her name. She headed straight for Great Smoky Mountains National Park, whose misty vistas and rhododendron-covered hillsides attract more visitors than any other national park in the country. Crowded? Yes. But a day spent traveling the Newfound Gap Road, even in high summer, offered nothing but beautiful, green forest solitude. The Great Smoky Mountains have an irresistible pull. When I realized I had a couple of days at the end of a conference I was attending in Atlanta recently, I checked a map to see what nearby routes seemed the most alluring for a quick summer jaunt. I was thinking of covering some new ground, but in the end, it was the good old Smokies that called my name. The Smokies don't have the sky-scraping peaks of the Rockies or the thousand-foot waterfalls of Yosemite. They don't boast gigantic sequoias or vast glacial ice fields. In fact, their main claim on the record book is that they attract more visitors than any other national park in the United States. But what exactly is the attraction? I think it's more than the park's convenient location. 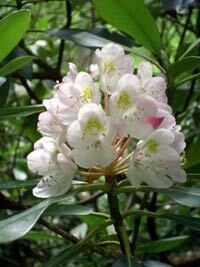 The misty vistas and rhododendron-covered slopes of the Smokies are quintessential, all-American scenes. These are the mountains you go over to get to Grandma's house, the ones "she'll be comin' 'round" when she comes. I've never lived in the Smokies, but when I visit, I always feel as though I've come home to the heartland. Summer is peak tourist season in the Smokies, and I was a little concerned about bumper-to-bumper traffic and finding a place to park at the viewing points. Stopping at the Sugarlands Visitor Center did nothing to allay my fears. I did find a place to park, but the place was mobbed. Even so, I bought a packet of maps and pamphlets about routes and trails in the park without even waiting in line. The Smokies may attract hordes of visitors, but the National Park Service has learned to accommodate them. 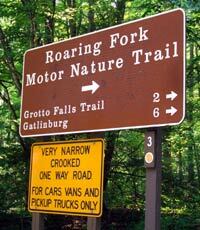 After perusing my new maps, I decided I had time to backtrack a bit and drive a scenic loop accessible from Gatlinburg with the appealing name of "Roaring Fork Motor Nature Trail." This narrow, one-way paved road (no RVs!) winds through old-growth forests past old cabins, grist mills, streams and waterfalls. It's only five miles long, but I was glad I had plenty of time to take it slow. It made the experience much more like a hike than a drive, especially when red taillights in front of me forced me to stop completely. At first I thought I'd had the misfortune of being caught behind a breakdown on a one-lane road, but the real reason for the stop was far more enchanting: A young black bear was rummaging in the underbrush near the side of the road. Several parking areas along the road provide access to old structures and trailheads. I stopped at Noah "Bud" Ogle's farm, where it's possible to see how the Roaring Fork loop has been cobbled together from old mountain paths that once wormed their way through the forest to the various homesteads and outbuildings. Back on the Newfound Gap Road, I headed south through Sugarlands Valley. The road follows the West Prong of the Little Pigeon River, through a lush but young hardwood forest that has grown up since the land was reclaimed from farmland. "Quiet walkways" are marked by signs every few miles, and there were plenty of places to park and enjoy them. 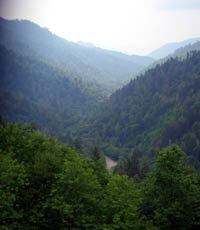 The Smokies are plenty big enough to absorb the summertime crowds and give everyone a taste of green forest solitude. At Campbell Overlook, I paused for a misty view of Mount LeConte; at 6,593 feet, it is the third-highest peak in the Smokies. Back in 1989, I hiked to the summit and now I wished I had the time for a return trip. It's an all-day hike, however, so I just spent some time remembering the climb through the different life zones to the lodge at the top. The road winds higher as it twists through the mountains. 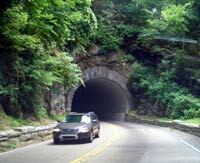 A tunnel built in the 1930s disguises "The Loop," the spot where the road crosses over itself to ease the steep ascent. The altitude gain is reflected in the foliage as the road rises. The rhododendron bloom on the lower slopes ended months ago, but on the high banks of the river, it was springtime in July. The white and light-pink flowers were so spectacular that it was hard to believe they were actually growing wild. I pulled off the road at Morton Overlook. At 4,887 feet, it offers a panoramic view of the Little Pigeon River; I could even see the road I had just traveled snaking across the valley floor. The trees up here are spruce and fir, and the air was noticeably cooler. If you can stop at only one point along the Newfound Gap Road, stop at the gap itself. At 5,048 feet, it's the road's highest point and the lowest pass through the mountains. It was named "Newfound Gap" because until its discovery in the 1850s, everybody thought that Indian Gap, another pass to the west, was the easiest route through the Smokies. From Newfound Gap, which marks the border between Tennessee and North Carolina, you can see for miles to both the east and west. The Rockefeller Memorial, which straddles the state line, is an impressive stone monument honoring the $5 million donation from the Rockefeller Foundation that helped purchase the land for the national park in the 1930s. 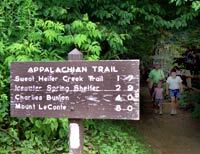 The other item of interest at the Newfound Gap viewing point is the Appalachian Trail. 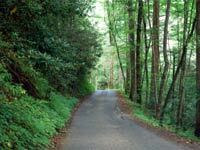 Sixty-nine of the trail's 2,144 miles lie within the boundaries of the Great Smoky Mountains National Park. Now I can boast that I've walked on it, even though I can claim only about a hundred yards. It's all downhill from Newfound Gap. I had to pass up another side trip that looked enticing. The seven-mile road to Clingman's Dome rises to a parking area for a trail to the highest point in Tennessee. From the observation tower, you can see seven states on a clear day. I moseyed on back down through the maples, oaks and dogwoods, ending my day in the Smokies in Cherokee, North Carolina. While reminiscent of Gatlinburg in terms of tourist traps per square foot, the town also displays its American Indian heritage. Street signs are written in both English and Cherokee, and there are a number of American Indian art and jewelry galleries. The next time I'm in the South, perhaps another route will beckon. I almost hope not, however, because a drive through the Smokies is a road trip worth repeating. The Newfound Gap Road is like your grandmother's peach cobbler: You can't get it anywhere else, and it always makes you want to come back for more.